From 80lb cream cardstock, cut a 5 1/2” x 7 1/2” rectangle. Die cut Els Van de Burgt Studio – Tags & More 9/Sparkle (1077) from 4 1/4” x 7” rectangle of Soft Finish 100lb cardstock (PSF102). The corners are from Els van de Burgt Studio – Fitted Frames 1/Lace Rectangles (1061). The background papers for the wallpaper, flooring, and carpet are from G45’s “A Christmas Carol”/Solid & Patterns collection. 3 CountryScapes – Woods 4 Holiday Evergreen & Trimmings (1093) from Silver Metallic Shimmer Sheetz (SS 0211) and the presents from patterned cardstock. Click here for a helpful video on how to die cut. Stamp Rosie’s Roadshow carpet on G45’s pattern & solids paper and cut it out to placed under the tree. The December month sticker is also from Rosie’s Roadshow. 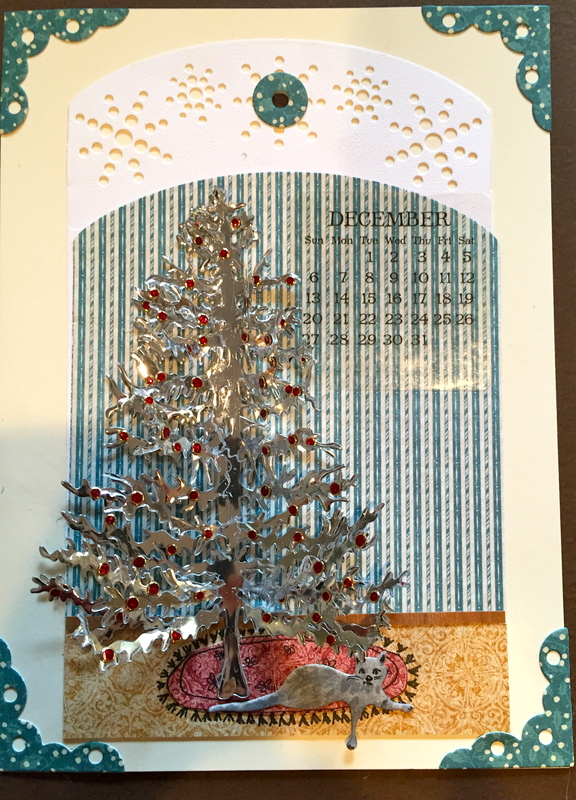 I chose not to back the Shimmer Sheetz with Clear Double Sided Adhesive since I wanted to “bend out” the boughs and give dimension to the tree. I simply used Beacon’s Zip Dry glue on the trunk of the trees to hold them together. 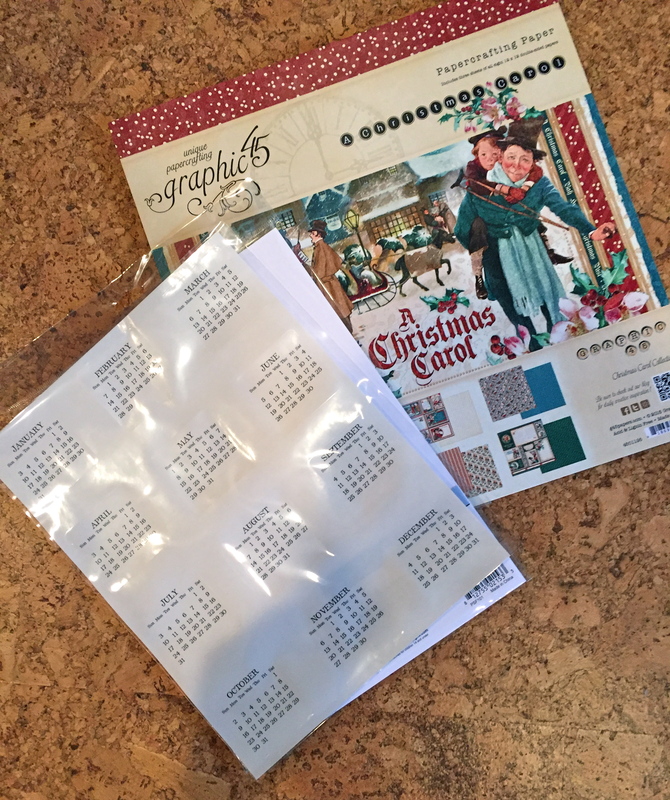 Glue the tree in place on the calendar using the same glue. Add Glitter Dots in red (or your favorite color) to the branches. Click here for a helpful video on Glitter Dots. Shade the cat; I used PanPastel Kit 3 to match my Clara. Adhere the cat under the tree. Create the potted mini Poinsettias and add the presents. Click here for a helpful video on Susan’s Garden Club – Tools & Techniques. This scene brings back some warm memories of Christmas and most of all, my mother. Create your own scene for a memorable December to finish off the year. My favorite Christmas holiday memory is being with family on Christmas Eve. As a child, it was my grandparents’ house. Then it was my Mom’s house with my kids, her grandchildren. It was chaotic, exhausting but fun. We continue that tradition at my daughter’s in memory of my Mom, who loved Christmas. I came from a large family and know exactly the “happy” chaos you’re talking about. Thank you for sharing. Was the year that my two brothers and I asked only for new bikes. As ours were lost in a fire. That Christmas morning we got up and all ran to the tree to see if we had our new bikes. There was only two boys bikes under the tree. Talk about being let down. After our tree we went to our grandparents trailer for their tree. I was feeling down and wasn’t really looking at the tree as we entered the living room. I sat there for a good ten or fififteen minutes not paying attention to what was going on. My grandmother asked me to go into the kitchen to get her a drink of water and I slowly walked to the kitchen with my chin dragging to the floor and wasn’t watching where I was going and walked right into something. I looked up and there was My new bike. I shouted and screamed, HE DIDN”T forget Me. There was a note on the bike telling me that there was’t enough room at our house to leave three bikes and left mine at my grandparents. The happiest Christmas ever as that is all the I wanted. my favorite christmas holiday was 1966 when my first daughter was born on christmas eve. even got a glass of wine. One of my favorite Holiday memories came about because one of my 3 sisters could never wait until Christmas to open presents. She knew mom hid our presents in the attic so she climbed up there and found bags with each of our 4 names on them. My mom knew she did this. So that year the only thing that was in those bags were Bibles. Of course, on the big day there were lots of gifts under the tree! We have remembered and laughed about how devious she was that year almost every year since and still love to tell our grandchildren about it. To this day my family laughs about one Christmas where 2 of my brothers did not get any gifts from Santa because they were “that bad” all year!!! (Actually, my mom felt bad and couldn’t give them nothing, so they got a letter from Santa and each got an action figure and an outfit for the toy). A few years ago my mom found embroidered pillows (you know the small ones) the said “Santa I Can Explain”. So before the rest of the guests came my mom had them open them in front of our immediate family and we all had a good laugh!!! We will be laughing about that forever!!! One of my favorite memories is of many Christmas eves when we were little. My dad, us 4 girls and aunt and uncle would go for a car ride to look at Christmas lights. My mom was over at the neighbor’s having coffee. When we came back to the house, Santa had come! 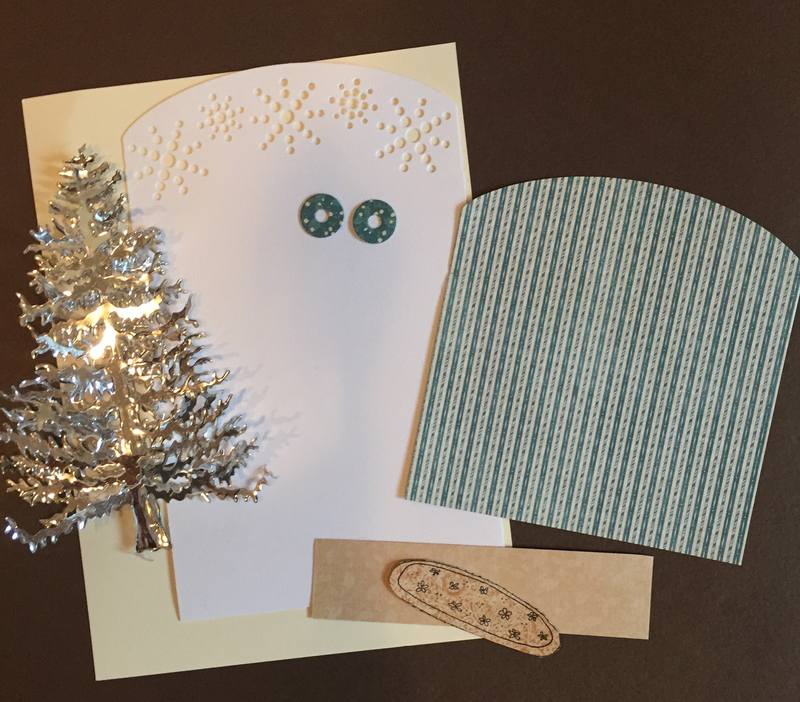 Memories of a silver tree with turquoise ornaments and a revolving color wheel that lit up the tree. Sounds exactly like the one you had Susan. We begged mom and dad to bring back our green tree and when the aluminum trees went out of fashion we were happy to have our “real green one back. Stunning card! I love the tree, and the cute tree skirt and kitty too! I remember some Christmas Eves spent at my grandparent’s Victorian house in Santa Barbara. We went to midnight mass and it was exciting to get to stay up so late, and hoping to catch a glimpse of Santa! When we lived in California, we loved to go to Santa Barbara and see the houses lit up. Also, the parade of boats in Oxnard. Good memories. Christmas shopping with the snow falling, Christmas lights and decorations and the Christmas music being piped outside while we walked out in the cold from store to store. My favorite memory was when I was in 5th grade. Every year my mom had us look at things in the Spiegel catalog and make a list of what we might want Santa to bring. My brother and 4 sisters made huge lists. I knew we didn’t have too much money (and I knew who Santa was) so I tried to ask for only 2 or 3 things. I think I only asked for one thing that year. A Jon Gnagy drawing set. I loved watching Jon Gnagy’s Saturday morning TV drawing show. Christmas morning, there was a large package for me under the tree. I thought I would die of happiness. I found it to be a little advanced for me later, but I still remember how happy I was to get it. When I was an adult, my mom told me that she felt bad that I asked for so few things, so she always tried to get me what I wanted even if it was more expensive than my brother’s and sister’s toys. Wasn’t that sweet of her? What a wonderful memory. Being from a large family, we knew money was short too, so we all just got one big gift…they were the best Christmases! way you made this sweet card. lot of fun with it. Thank you for sharing your memory. Have a blessed holiday. My favorite Christmas memory is with my family on Christmas Eve. In a darkened living room, my Dad, three sisters and myself would kneel before the manger – lit only by a single blue light, then we would hold hands and sing Silent Night. My Grandfather build a Creche for the beautiful ceramic Nativity he bought for my Grandmother; I have that set and every year set it up by the tree. Reminds us what the holiday is all about. Wow! You are going to have a tough choice here! Loved reading all the Christmas memories from everyone! My favorite Christmas memories are of the whole family going over to my Grandparents house on Christmas Eve. It was such wonderful excitement! Aunts, Uncles, cousins…friends, everyone was family. All of us kids running around, the twinkling lights and shiny ornaments that hung from the cornice on the big picture window, the big tree with what seemed like 1000’s of presents. The house was filled with delicious smells from the kitchen, a fire burning in the fireplace, everyone dressed up fancy! After dinner we would all gather in the living room, Santa would come and we always had to sing a Christmas carol before he handed out the presents from under the tree! Grandma and Grandpa always made it so special! Warm cozy love, that’s what I remember most! First of all, it will be a random drawing, because you’re right…great stories and memories. I love hearing about your memory. I don’t really have any “favourite” Christmas/holiday memories! My father hardly had anything to do with us kids so it was left to my Mum. As there wasn’t much money we didn’t even get presents that often. It would be nice at almost 53 years old to make some happy memories rather than all of the bad ones, such as losing my older brother earlier this year and his wife not even having the decency to call our Mum and let her know he was admitted to the hospital in the first place! That is just the tip of that iceberg by the way! awesome gift!!! We would put the kids to bed , decorate the tree with my parents and in-laws then wake up the kids to open their presents that Santa had left….that was a tradition that my parents had always done when I was little!!! My daughter has already put up her tree! I like the “magic” that you experienced with the children waking up to surprises. Your card is fabulous. My n’est memory is when I was 5 years old. We were waiting for some family members who were coming back from Christmas Eve mass. Suddenly my mother saw à man disguised as Santa Claus walking down the street. My uncle open the door and called : Santa Claus come here Chantal is waiting for you. And the man came and talk to me. I was so happy that I remember it like if it happened yesterday. Thank you for bringing this memory back. What a sweet Santa; I do believe they walk among us to bring happiness when we need it most! Another stunning card and what a great gift to win. These stories are wonderful – such sweet memories but I think it will be a tough job to decide – Good Luck! Good thing it’s a random drawing! My favorite memory is going to Midnight Mass with my Dad. He sang in the choir so my brother and I got to see everything from the choir loft at the back of the church,very special memories.When we got home Santa had already visited our home so we got to see the gifts under the tree before Mom shoed us off to bed not waking up my little sisters. One of my best memory is the year that my brother and I got the Christmas tree. We where in our teens. We got the tree home and it was to tall. My brother was going to cut it down, yes he cut the top out!! Oh well we decorated it anyway, it was a beautiful tree. I love decorating trees and have been a little sad we didn’t have one last year, or maybe even this year. You see, someone dropped kittens at our house and we have these three adorable, but very mischievous rascals that a tree wouldn’t survive. I have to think of creative ways to have some decorations up! Thank you for sharing your memory. Beautiful card. For Christmas Eve we always went out to look at the lights then when we came back Santa had been there. One year we came back to hear Uncle Charlie yelling “hurry you’ll miss him”. So we ran into the living room to see him sprawled on the floor with his arms outstretched through the door saying he just couldn’t hold Santa any longer. We ran outside to look for him but he was gone. It was so exciting and such a fun memory. That is a fun memory and so clever of your uncle! DELIGHTFUL card, LOVE your tree … it reminds me of one we had for many, many years growing up!! !